Beyond Good and Evil is one of the most scathing and powerful critiques of philosophy, religion, science, politics and ethics ever written. 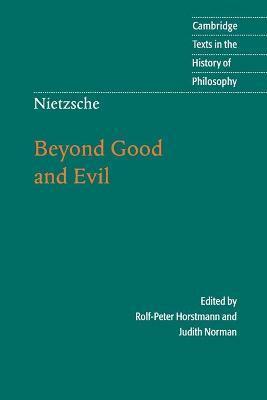 In it, Nietzsche presents a set of problems, criticisms and philosophical challenges that continue both to inspire and to trouble contemporary thought. In addition, he offers his most subtle, detailed and sophisticated account of the virtues, ideas, and practices which will characterize philosophy and philosophers of the future. With his relentlessly energetic style and tirelessly probing manner, Nietzsche embodies the type of thought he wants to foster, while defining its historical role and determining its agenda. This edition offers a new and readable translation, by Judith Norman, of one of the most influential texts in the history of philosophy, together with an introduction by Rolf-Peter Horstmann that sets it in its historical and philosophical context. Preface; 1. On the prejudices of philosophers; 2. The free spirit; 3. The religious character; 4. Epigrams and entr'actes; 5. On the natural history of morals; 6. We scholars; 7. Our virtues; 8. Peoples and fatherlands; 9. What is noble? From high mountains: aftersong.